Image | This entry was posted in The Scottie Chronicles and tagged Black and White Scotch, black and white scotch ad. Bookmark the permalink. Love the vintage ads for Black & White scotch. They call it ‘The Scotch with Character’ just as Scottish terriers have plenty of. Smart marketing department, I’d say! Love these advertisements with scotties and westies, they are cousins I’m sure! We have a couple around our home, one is ” take your dog with by rail ” advertisement for train travel, the other one is “Winter is coming” for Champion spark plugs, and our scotties have been pretty Sparky!!! How about these 2 actual B&W bottles? They’re about 50 years old (which is old for terriers). Westies may be our cousins, but I prefer the distinguished bearded scottie! 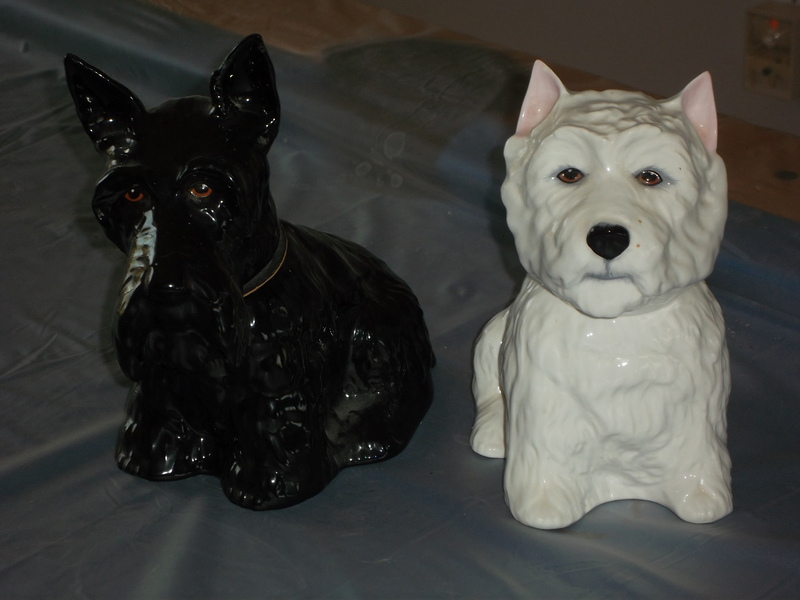 We have a Porcelain or ceramic planter like this that is vintage made in Japan that Mum bought on EBay, and they very successfully copied the look on their faces and pose just like in the picture! Tessie is a Westie and Riley is a Scottie! We love black and white memorabilia! Love that!! Got some devilish looks on those faces! Or maybe they had been in the Scotch!! We love all of the vintage stuff.